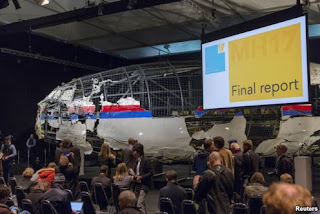 In a White House statement, National Security Council spokesman Ned Price said the Dutch report issued Tuesday " is an important milestone in the effort to hold accountable those responsible for the shoot-down of the aircraft and the killing of those aboard." 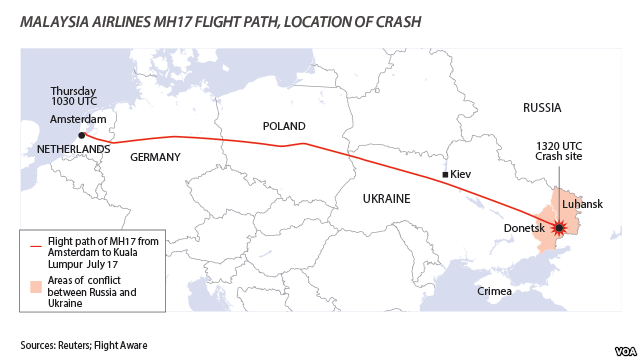 "Our assessment is unchanged -- MH17 was shot down by a surface-to-air missile fired from separatist-controlled territory in eastern Ukraine," Price said. Turkish authorities on Tuesday banned a protest rally and march by trade union and civic society activists who lost friends and colleagues in Turkey's bloodiest terror attack, but hundreds of people defiantly gathered for the protest. The two suicide bombings on Saturday came amid political uncertainty in the country -- just weeks before Turkey's November 1 election which is in effect a re-run of an inconclusive June election. 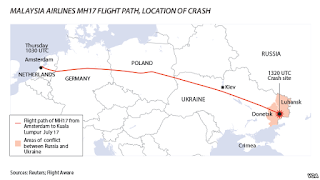 The bombings raised fears that the NATO country, a candidate for European Union membership, may be heading toward a period of instability. The blasts have further polarized Turkey as it grapples with more than 2 million refugees and tries to avoid being drawn into the chaos in neighboring Syria and Iraq. Dogan news agency video footage on Tuesday showed police pushing back a group of demonstrators trying to reach the rally to commemorate the 97 victims of the two blasts. Turkish Prime Minister Ahmet Davutoglu, third right, his wife Sare Davutoglu, third left, his deputies Yalcin Akdogan, second right, and Cevdet Yilmaz, right, pray at the site of an explosion in Ankara, Turkey, Oct. 13, 2015. 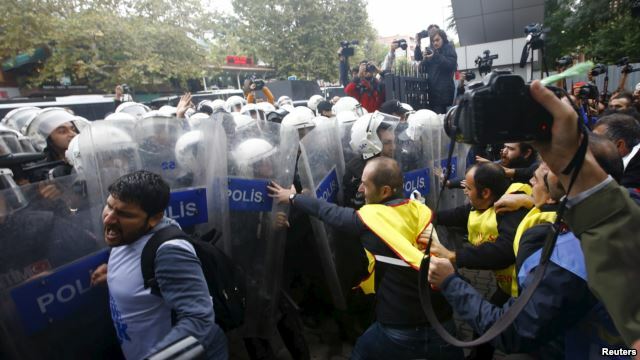 Plain-clothed police pushed at least two demonstrators to the ground and detained them. "Our brothers were killed! What are you doing?" a woman demonstrator was heard shouting. The Istanbul governor banned the protest citing "sensitivities at this time" and because the routes demonstrators planned to march along were heavily used by the public. 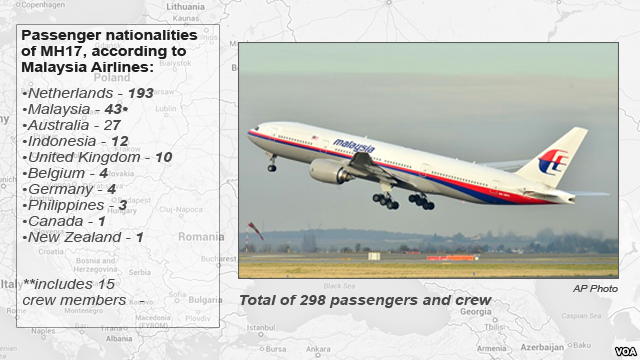 Prime Minister Ahmet Davutoglu has said the Islamic State group was the main focus of the investigation. Authorities said Saturday's attacks bore similarities with a suicide bombing that killed 33 activists at a town near the border with Syria in July. No one has claimed responsibility for Saturday's explosions that also wounded hundreds. The bombers likely infiltrated Turkey from a neighboring country, Deputy Prime Minister Numan Kurtulmus said, adding several arrests were made in connection to the attacks. He did not elaborate. 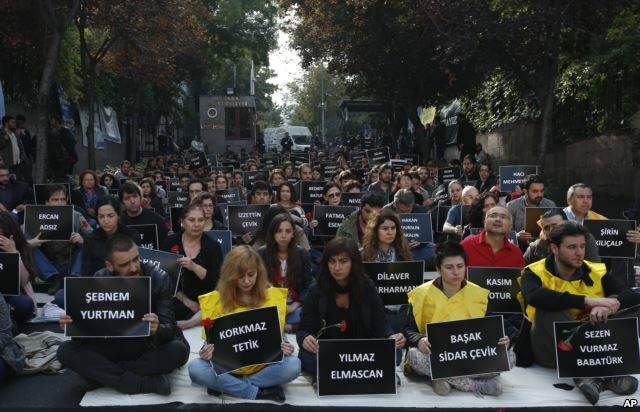 The students of Ankara University hold the placards with the names of those killed in Saturday's deadly explosions during a sit-in protest in Ankara, Turkey, Oct. 13, 2015. As with previous terror probes, authorities imposed "partial secrecy" on the investigation which even restricts defense lawyers' access to information. The government has also banned the publication of images of the aftermath of the attack. 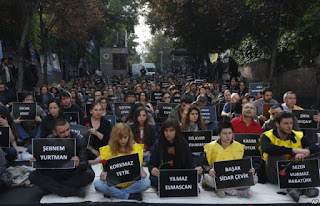 In Ankara, some 200 students held a brief sit-in at Ankara University's faculty of political science to commemorate the victims. The youngest was 9-year-old Veysel Atilgan, who died in an explosion outside Ankara's main train station, along with his father. He was buried on Monday following an emotional ceremony at his school. 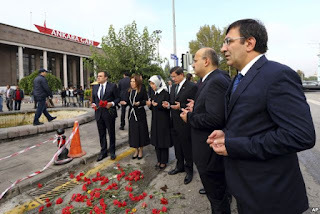 The city is on edge following the blasts and on Tuesday, police detonated a suspicious bag found near the station's VIP lounge, hours after Davutoglu visited the site to lay carnations in respect to the victims. The bag, however, contained food.